Writing About: "Living Well – Here and Now"
I’ve been sitting with loss and grief this week. 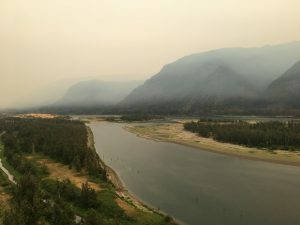 The western portion of the Columbia Gorge went up in flames this week. As I write this, more than 33,000 acres have burned, the fires are 7% contained, hundreds of homes have been evacuated (including several friends’ homes), and my beloved trails and a climbing area have burned. 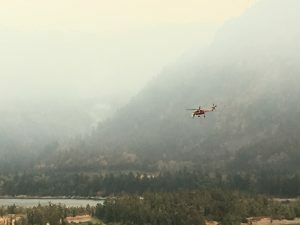 Oregon State Police tell us that the fire was likely caused by a group of teenagers playing with fireworks along the Eagle Creek trail. Earlier this week I was overtaken by waves of sadness and grief. 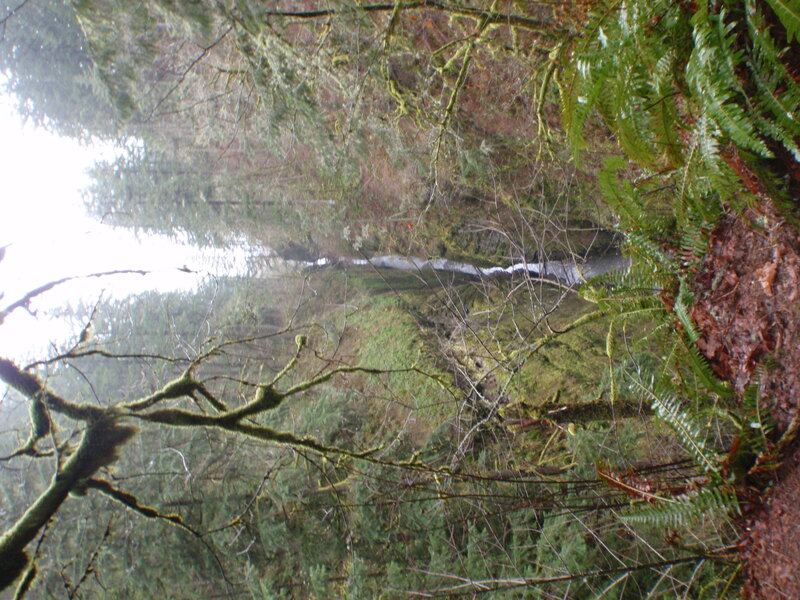 Beyond recreation, the gorge was a place of spiritual replenishment for me during my 31 years in Portland. Walking there fed my soul. There were some dark times when I found respite among the trees and waterfalls and returned to town restored. Like many Oregonians, I’m grieving this loss. I’m struck by how hard it can be to simply grieve. The “show stopper” aspect of grief came into focus for me this week. Grief can stop us in our tracks. It invites us to stop what we’re doing and come to terms with the loss that precipitated the grief. It reminds us that no amount of action can reverse some losses. Some of the healing power of grief comes during that slowing down process. We need that time in order to come to terms with loss. By slowing me down, grief gives me enough time to feel the important things and to work the loss through to a conclusion. The conclusions I reach after grieving are generally more life affirming than those I reach if I refuse to grieve a loss. But we live in a culture that doesn’t want to slow down and that values action and movement, rather than stopping. Additionally, the public opinion pendulum has swung toward taking swift and decisive action anytime we feel wronged. It seems all the more satisfying if the action has finality in it. We love absolutes. Anything less, we’re told, is woefully soft. It’s a social offense in some circles to be soft. But grief is a soft thing, and it softens you up for a time. Ask someone who’s lost a parent, a child, a love about that. Or, like this week in Oregon, a special place. We seem to have lost our bearings about things that we judge to be soft. Grief isn’t popular, it just isn’t cool. Consider too, that we have the capacity to convert the energy of one strong emotion into another. For example, we often see this happening with shame – some folks become adept at converting the emotional energy of shame quickly into anger. Gershen Kaufman makes this observation in his book, “Shame: The Power of Caring.” This week I see a similar conversion phenomenon at work regarding grieving the loss inflicted by the Eagle Creek Fire. The burning of our beloved gorge has been a tremendous loss and we feel that pain when we see the images of burning trees and deal with the smoke wafting through our neighborhoods. The sadness of that loss should queue us up to grieve, but over and over this week I see appropriate grief being cut short, converted into the only action that seems available – looking for punishment and retribution. It appears that slowing down enough to feel the grief and to complete its important work just isn’t a publicly celebrated option. Instead of slowing down, I hear people and journalists jumping quickly from discussing loss – to defining retribution and vengeance. The teenager(s) who are accused of starting the fire are de-humanized as “assholes,” “idiots,” and “schmuck” in the local media; and much worse out loud. Our shared loss is briefly mentioned and then prison sentences, lifetime public service penalties, and let’s take down their parents too, are the quick and ready reactions. Instead of grief we go to punishment and retribution. I found myself going there on Monday as the fire grew. Really? Is this how we’ll make a better world? Let’s slow down. We’ve lost something beautiful and important to this fire, and the loss is terribly sad. We could come to terms with that loss by grieving, and then get on with the next steps, including justice and rehabilitation. Skipping ahead to retribution and punishment bypasses the grief process. And if we refuse to grieve, then the process of acceptance and moving on is truncated and incomplete. When loss isn’t worked through, then the aftermath is less rich and less life affirming. So first, let’s come to terms with this loss. Let’s grieve the loss and let grief do its good work in us. Slow down, and resist the message that slowing down is weakness. It’s a strength, and our lives will be richer by working through the loss. Additionally, let’s use this situation as a means to promote a more thoughtful, non-absolute, social process for dealing with harm, loss and negligence. Let’s get the fire out and take care of the people who are affected by it. And then, let’s count on the best and the brightest from our Department of Justice juvenile division to deal with the accused. DOJ has been down this road before. Let’s reserve the call to quick definitive action for those circumstances where it makes sense as the best option for our safety. I’m sad about the Columbia Gorge fire and I anticipate missing some special places. I plan on grieving my loss – I’ll slow down and let grief do its work. I figure that I’ll come out on the other side of grief with the same wish for special places in nature. I’m confident that I’ll find those places on the other side of this loss and grief. 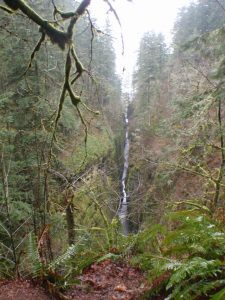 I’m thinking about this: As the years go by, the burned forest will be green again; new hiking trails will be built if the old ones erode out; the waterfalls will continue to run; everything will grow and continue on. May we all do the same. And those teens with the fireworks? I don’t have adequate information about them now to understand their character or their motivations. Any conjecture I make about them at this time is guesswork. A fantasy. When the time is right I’d like to hear from the insightful professionals in our juvenile justice system about the appropriate course of action. In due time. Helicopter refilling for another drop. This entry was posted in Existential, Self and World on September 13, 2017 by Stephen.